POWEROLL PLUS Hot Cream is a unique blend of essential oils. 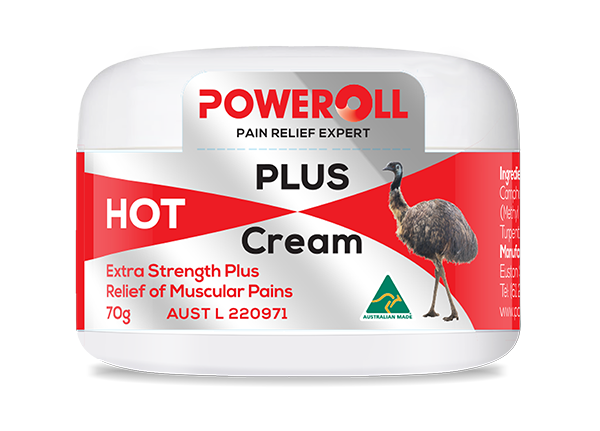 It also contains Emu oil. Helping to massage away muscular aches and pains while relazing tense muscles. Ideal as a natural pain relief alternative to invigorate muscular fatigue. Ginger Oil 1.05mg, Camphor oil white 8.8mg & Wintergreen Oil (Methyl salicylate) 23mg. Also contains Australian emu oil, Turpentine Oil, Menthol & Lavender. Apply liberally to painful muscle or joints 3 to 4 times daily and gently massage into the affected area until the cream completely disappears. Repeat as necessary for at least two weeks or until pain subsides. For external use only. If symptoms persist consult your healthcare practitioner. STORE BELOW 25ºC. Contains Propyl Hydroxybenzoate.